A friend of mine left our library this week to run her own youth service department. I am so happy for her and have no doubt that she'll do great. She asked me if I had any tips for being a teen librarian and I've been making a list all week. I thought I'd share with everyone what I've learned from my four+ years on the job. Unfortunately (or maybe fortunately! ), it takes longer than 5 minutes to read. This first post is focused on Collection Development. 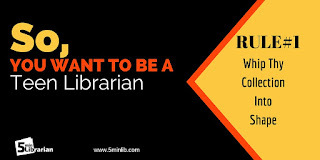 I highly recommend every teen librarian starts there. Once you start programming, it is really hard to stop. Before you jump down that rabbit hole, use your first month to take a hard look at the collection you inherited. Run reports to see what is popular with your current teens and weed the old books that aren't circulating. Your circulation numbers will dramatically improve when you drop the dead weight. It is a win right out of the gate! If you can, make reoccuring lists of items that circulate well, ones that aren't, and those that are missing/lost/billed. Your OPAC (the program your library uses to keep track of circulations) should have an option to continuously run the list after X many days, so you'll be easily updated without any work on your end. (Just make sure you check out that list when it arrives in the inbox!) I have to weed my collection at least twice a year. Depending on how big your budget is and how much space you have, you'll need to do more or less. Whatever you do, DON'T weed right before your busiest times (for us, that is two months before Summer Reading... And all summer). I, uh, learned that the hard way. Don't forget about your missing and billed items. The general rule in our library is to give missing items six months to return, but you might decide having a second copy sooner isn't a bad idea. If you think you'll get a lot of circulations, it could be worth the money. Take the books that circulated well over the past two years and make sure you are very familiar with them. Read them if you can, speedread them if you can't (see next tip below). Make a list of programming ideas tied to what your teens like. Make book list recommendations off of these popular books so you are prepared for the big requests and can easily talk to your teens about their favorite reads and can quickly make your own recommendations. We have a three part series on how to use NoveList, if you're lucky to have access to that resource! I wish I took the time to learn this because it is impossible to read every book you order and honestly, there are genres I can't convince myself to read. Speedreading isn't reading -- it is getting cozy with a book and paying attention to their reader advisory elements. In a nut shell, it is reading a few chapters, skimming, reading the middle, skimming, and reading the end. Georgine Olson shared great tips on how specifically to do this, highlighting things to pay attention to and different ways to improve your speedreading skills. Since you're going through dozens of books a week, you'll want to create some kind of spreadsheet (or use an online program like Goodreads) and take notes. Your future self will thank you, especially when it comes to readers advisory. We wrote a whole post (7 Time Saving Tips for Ordering Books) about the benefits of using book vendors like Ingram and Baker & Taylor. They have cool features like giving full text reviews and will put books into automatic lists for you -- so every two weeks, you'll have a pre-made cart of books that got 5 stars. You can have them waiting for you to go through them -- or you can have them automatically ordered. Huge time saver! No more wasting time typing in ISBNs and wondering if you had already ordered it or decided against it. Epic Reads. http://www.epicreads.com/ Great book lists about what's hot and coming out soon. FictFact. http://www.fictfact.com/ Put your popular series into this database and they'll let you know when the new books come out. Fantastic Fiction. http://www.fantasticfiction.co.uk/ We also wrote a post about this, but it is THE best place to go for author and book information. It clearly states what books the author wrote, when they were published, if it was hardcover/paperback/ebook, when future releases are coming, and what number it is in the series. Unfortunately, they don't cover graphic novels. If your library is part of a consortium (or multiple library network), you're probably required to have the first copy of all your books as holdable. What this means is that anyone in your library system can request your library's book. It is a great service to those who know how to use your system. Unfortunately, it doesn't work so well if your teens like to browse and don't feel comfortable asking for help if they don't see it on the shelf. What many librarians don't know is that you may NOT have to make second copies holdable in your consortium. If you want to make sure a book is available for browsing, buy a second copy and make it unholdable. This is especially useful if your school required summer reading list is a popular book (<<cough>>Fault in Our Stars<<cough>>). Best of luck to all of you starting out!